G/4077 also GS/4077, Private, 8th Battalion, Queen’s Own Royal West Kent Regiment. Enlisted Tonbridge, Kent. Gained two campaign medals. Theatre of war France & Flanders. Died 6 October 1918 aged 26. Buried in Chiddingstone Causeway (St. Luke) churchyard, Kent. 6th October 1918 age 26. Born in Leigh, Kent in about 1895. Baptised on 1st May 1898 at St. Mary’s, Leigh, son of Mrs. Rose Streeter, Recorded as living at Boar Place in 1901 where his step-father worked as a General Labourer. 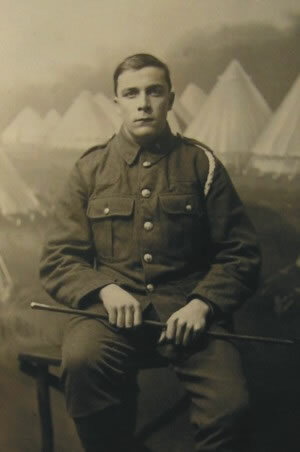 He enlisted into the 1st Battalion Royal West Kent Regiment, was gassed during an attack on Hill 60 and invalided home. When he was considered fit by an army doctor he was sent back to the 8th battalion in France. There he fell ill and was repatriated to Sheerness Hospital where he died on the 6th October 1918. At the time of his death his family were living at Mount Joy, moving to 3 Council Cottages, Moorden, Leigh, Tonbridge in 1927, this later address being given by the CWGC. As Percy Parker died towards the end of the war, the 1918 Electoral Register for Chiddingstone had Percy Parker marked as an absent voter living at Mount Joy . Remembered on the Chiddingstone Causeway and the Edenbridge Hospital War Memorial.